In the Access Controls tab, you can set the various options for limiting access to your survey. This is the message that will be displayed to people attempting to take your survey after it has been stopped. A survey can be stopped either manually from the stop button by navigating to Surveys > View > Surveys > Active or from having reached the closed date. There are two options for limiting your survey to single responses. 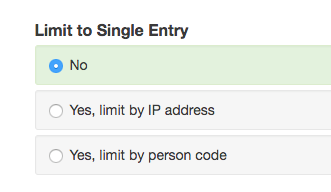 Yes, limit by IP address - This option will only let a respondent complete your survey once. This is determined by the IP address of the computer taking the survey, so respondents will still be able to move to a different computer and retake your survey. This type of restriction will also have limited effect for dial-up internet customers or other respondents who have frequently-changing IP addresses. Yes, limit by person code - Use this option if you are including a 'person code' in the URL and you want to limit respondents to just those that have the person code. 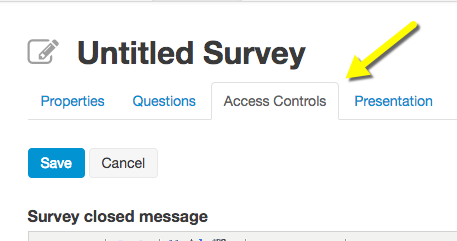 This option will automatically close a survey once a pre-determined number of responses has been received. This option is good for those that maybe using SurveyTown for registration or entries that have a limited number of responses that can be received. These options will let you specify an opening and/or closing date for your survey. If you do not specify an opening date, the survey will be made available as soon as it is activated. If a closing date is not specified, the survey will remain active until it is manually stopped from the Surveys > View > Surveys > Active overview screen.